By Rev. Leo Yates, Jr.
Hospitality is the way forward to welcoming all people, and this is especially true when it comes to including Deaf, hard of hearing, late-deafened, and Deafblind individuals and their families. Practicing hospitality and welcoming people to worship are a part of the Wesleyan way of reaching out, building growing churches, and thus to move away from numerical and spiritual decline that has steadily undermined many of our congregations. As many congregations and annual conferences prepare to observe an upcoming Disability Awareness Sunday, we offer a case study and some quick tips for a Deaf-friendly worship service from the United Methodist Committee on Deaf and Hard of Hearing Ministries (a committee of Global Ministries) with a goal of improving accessibility and inclusion. First UMC in Fredericksburg, VA wasn't looking to begin a Deaf ministry in 2002. It's one of those times when Deaf people showed up wanting to worship. It turned out that the Deaf couple just moved to an active retirement community. They had been members of St. Matthews UMC of Bowie, MD and were dedicated to the United Methodist Church. While there was a successful Baptist Deaf church in Fredericksburg, the older Deaf couple insisted that they wished to keep faithful to their United Methodist roots, as the wife was a PK (pastor's kid). The pastoral staff at First UMC didn't hesitate. They not only accommodated the Deaf couple, they went beyond just "accommodating" by arranging to have a sign language interpreter for services, promoting the Deaf ministry, teaching a sign language class, and reserved a seating area for them (the husband was Deafblind with partial vision loss). Interestingly, the Deaf couple attended the contemporary worship service so they could feel the bass and drums (they sat near the band/worship team). The Deaf couple attended for fifteen years before having to move to an assisted living facility. While it was a small Deaf ministry, it was a way to personify the church's commitment to welcoming Deaf, hard of hearing, late-deafened, and Deafblind people. If you have an interpreter, be sure to promote it. Promote it on your outside sign, in your church bulletin, and on your church's website. Share it with other pastors and church leaders in the community. Teach the Lord's Prayer in sign language by including the UMC's ASL Glossary video. Do it on 4 Sundays or more. 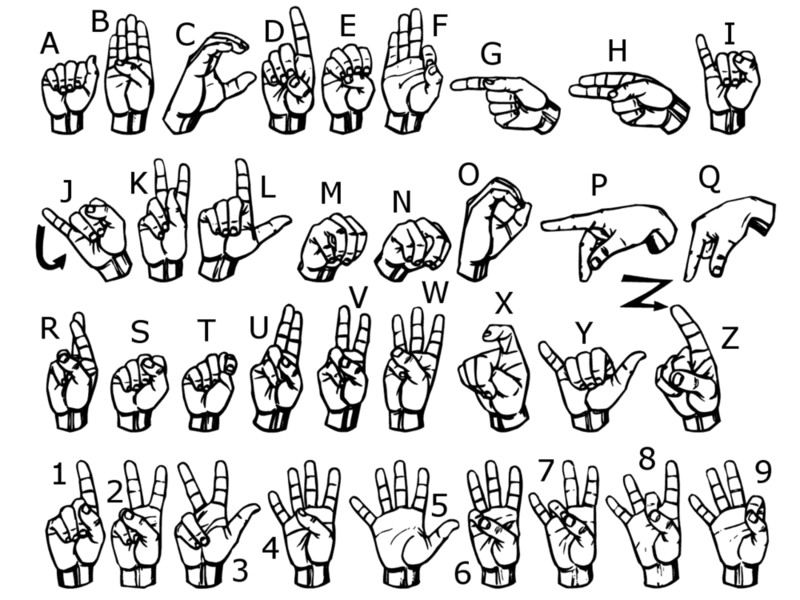 Include the manual alphabet (in ASL) on the back of the bulletin. Try not dim the lights all the way as Deaf, hard of hearing, late-deafened, and Deafblind people still need visual access (e.g., for seeing the interpreter, for lip reading, or prevent a Deafblind person from seeing anything at all). Learn some church-related signs and use them during worship. Here is one such video on YouTube. Teach greeters, ushers, and even the pastor to sign "good morning" to both Deaf and hearing people. Here is a diagram and a video. Have a children’s choir or a youth choir sign a hymn or a song, whether the whole hymn/song or a stanza or two. This YouTube channel has several useful examples. Include a short Christian or biblical drama, as it’s visual. Perhaps act out a scene from a Scripture passage or the entire passage while you have a narrator to sign the Scripture. Verses do not necessarily have to be signed by the actors, as long as their gesturing and acting are clear. The Good Samaritan story comes to mind as an easy drama to do. Use more visuals throughout the service, such as multimedia. Use a sound system with a microphone and/or offer an assisted listening device or system. This will assist hard of hearing and late-deafened people who rely on audio to have full inclusion. See the Guide to Assisted Listening Devices on the Resources page of our website. Be sure to have a few large-print bulletins (& inserts) on hand for any Deafblind individuals (not all Deafblind are fully blind, many are only partially-blind). If you do not have an interpreter, offer a copy of the sermon and any worship notes that will be a substitute. Do not panic if a Deaf person comes out of the blue. Some will still come regardless of an interpreter. Just be friendly, welcoming, and share hospitality. 2018 is the time to have churches be more Deaf-friendly and welcoming for Deaf, hard of hearing, late-deafened, and Deafblind people and their family! If you have questions or a consulting need, contact Rev. Leo Yates Jr at leoyjr@gmail.com. About the writer: Rev. Leo Yates, Jr. is a provisional deacon serving in the Baltimore Washington Conference. He serves on the United Methodist Committee on Deaf and Hard of Hearing Ministries.